Pittsburgh Medical Malpractice Attorney | Dattilo Law Offices, P.C. The Pittsburgh medical malpractice lawyers at Dattilo Law Offices represent individuals who have suffered serious injuries or have lost a loved one due to the negligence of others. But you don’t have to continue suffering. Our legal team is ready to listen to you. We will explain the litigation process and give you an honest assessment of your case to help you decide on the best course of action. At Dattilo Law Offices we are passionate about the representation of our clients because every client means something to us. Attorney Dattilo has won numerous multi-million dollar personal injury verdicts and settlements on behalf of our clients, assisting them to recover the compensation they deserve as a result of serious injuries. If you’ve been injured due to the negligence of others, contact our offices today. The Pittsburgh personal injury and medical malpractice lawyers of Dattilo Law Offices, P.C. invite you to explore our website. Learn about how a client-attorney relationship with our firm may help you recover damages from a serious accident, medical procedureor other cause of action based on negligence. Contact an experienced Pittsburgh personal injury lawyer at Dattilo Law Offices, P.C. Our Pittsburgh law firm offers FREE initial consultations for all personal injury andmedical malpractice cases and takes cases on a contingency basis. Please contact us online or phone our office at (412) 391-6300 to arrange a consultation to discuss your case. 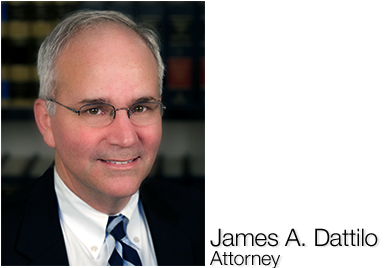 Among a number of notable distinctions, Attorney James A. Dattilo has received an AV Peer Review Rating from Martindale-Hubbell, which includes selection into the Bar Register of Preeminent Lawyers. This honor is a reflection of his high level of integrity, extensive legal skills, and long-standing experience. His accomplishments as a personal injury lawyer in Pittsburgh have also been recognized through his memberships as a Fellow in the Best Lawyers of America, Pennsylvania Super Lawyers, and the American College of Trial Lawyers. With over 50 years of combined experience, Dattilo Law Offices of Pittsburgh represents victims of personal injury and medical malpractice in Western Pennsylvania. Contact us today.